Jump back just 40 years and the same scene was raucous, with cashiers reading price tags and pounding numbers into behemoth electromechanical cash registers. Back then, if you wanted help with any arithmetic with more than just a few operations, some kind of mechanical calculator was your only choice. From simple “one-banger” adding machines to complex analog computers, mechanical devices were surprisingly capable data processing tools. Here’s a brief look at how some of the simpler ones worked. The first practical mechanical calculators came along in the middle of the 17th century (I’m defining “mechanical calculator” as a device containing gears, levers, cams, springs, etc., as opposed to earlier devices like the abacus. And the Antikythera Mechanism is a whole other thing). That’s when a young Blaise Pascal witnessed the tedium endured by his father’s employees in the tax office of Rouen as they tallied page after page of tax figures. Unwilling to be roped into the family business, Pascal invented a machine to do the work instead. 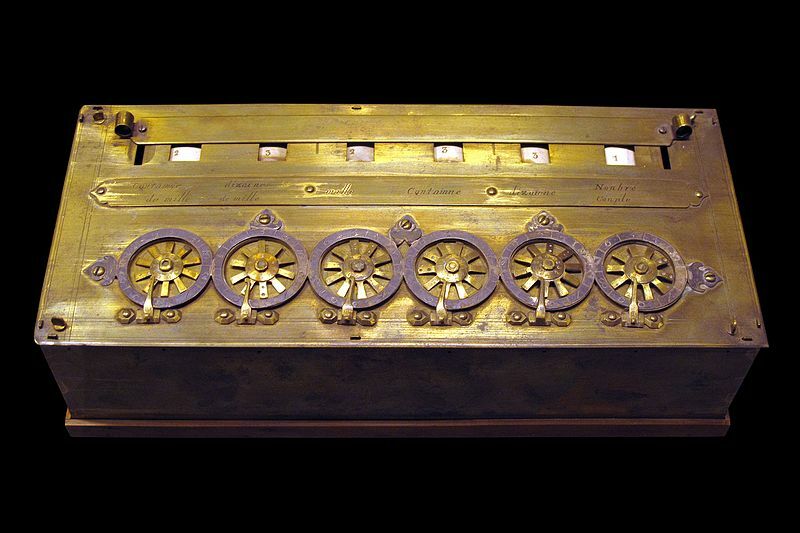 Dubbed the Pascaline, the device was a direct adding machine that was capable of adding and subtracting long series of numbers. The device went through 50 prototypes and was used with some success commercially; Pascal even made versions that worked in different numbers bases for specialized fields like surveying. The complexity of the machine was beyond the manufacturing technology of the day, though, so could not be manufactured affordably. But Pascal’s mathematical and mechanical genius paved the way for later inventors to pick up the torch. The breakthrough in Pascal’s machine, an operation critical to all mechanical calculators, was to perfect the carry mechanism. Arithmetically, carrying is the act of transferring a digit to the next highest significant digit. In mechanical calculators, where the digits of a number are often represented by wheels linked together by gears, incrementing the rightmost (least significant) digit past nine means that some mechanism needs to carry the value over to the next column to the left, so the display reads 10. If a machine can’t carry reliably — a fatal flaw in a machine invented by Wilhelm Schickard two decades before Pascal’s — it can’t add. Thomas de Colmar’s Arithmometer was the first commercially successful machine, and a lot of the principles it pioneered would be used for the next century. It used Leibniz wheels, drums with nine teeth of increasing length spread evenly over half the surface of the cylinder. Each input digit is represented by a gear that slides on a shaft running parallel to the Leibniz wheel shaft. The sliding gear rotates only when the teeth on the Leibniz wheel engage it, and how far it rotates depends on the position the gear was set to. The shaft the gear is on rotates the accumulator digit for that position as many times as the input digit was set for, and a carry mechanism took care of overflowing to the next accumulator digit. The rotation of each Leibniz wheel was offset from its neighbor by 18° to ensure that all the carries from less significant digits rippled up the accumulator before high order operations were performed. As complex and capable as the Arithmometer was, it was by no means optimized. In the 1940s, Curt Herzstark perfected his Curta calculator, which could do everything the Arithmometer could in a compact, elegant package that the operator could hold in one hand. Herzstark’s genius was to realize that the individual Leibniz wheels could be condensed into a single drum. Curta calculators are high collectible, and enthusiasts have even recreated Herzstak’s masterpiece with 3D-printed replicas. Mechanical calculators using input methods that the modern user can relate to would wait for quite some time. 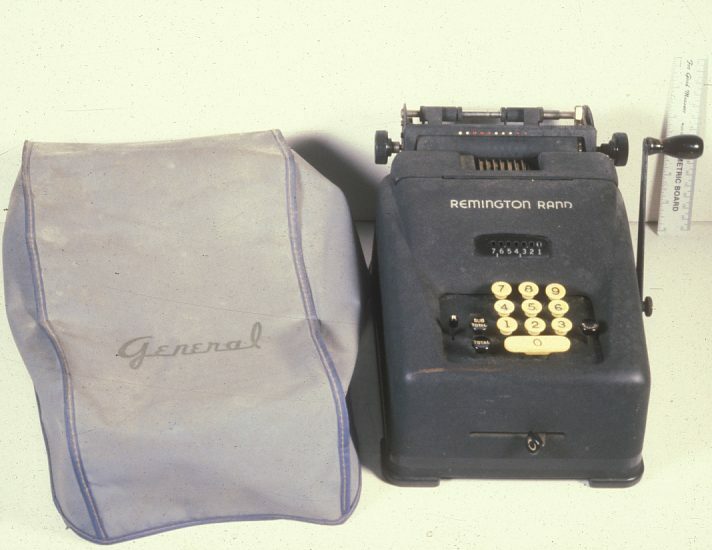 The Remington Rand Company released their Model 73 Adding Machine, with a familiar 10-key keypad, in the 1940s. The underlying principle, entering an operand and mechanically cranking it through an operation into an accumulator, is similar to earlier machines, but the details are different. First, the keypad is used to compose the addend by pushing down a peg corresponding to each digit in a matrix under the keypad. When the crank on the side of the machine is turned, a sliding rack for each digit is moved until it comes up against the peg for that digit protruding from the underside of the matrix, stopping it in the right position to print the correct digit on a paper tape. As the crank returns, the rack engages a series of gears that adds the addend to the accumulator. Total and subtotal keys allow final and intermediate totals to be printed. Addition is the primary job of a mechanical calculator, but it’s not the only operation possible. Subtraction is generally simple — just run the machine backward. Some machines, like the Curta, used nines’ complement addition to simplify the process. Multiplication is easy, too; since it’s just successive addition, most machines had a way to lock the current operand into the input section and allow the crank to turn as many times as the multiplicand indicates. But some machines allowed the accumulator mechanism to be shifted left and right relative to the input area, speeding up multiplication operations considerably. By the 1970s, the mechanical calculator had largely been replaced by more capable, smaller, and quieter electronic calculators. They may seem quaint today, but they were amazing tools that got the job done with what was available and even helped us get to the moon. Use to have one like the Remington-Rand. Just a lot more buttons. Heavy as…well you know. Some of these had a divide function as well. If the designer failed to lock out divide by zero, you’d get an endless loop of clanking and clacking. That’s actually very helpful to revealing what you’re doing when you’re working out a long division problem by hand. Would have been handy to have something like this in the classroom all those years ago. Funny — I never really understood numbers and how they related to each other until I got my first pocket calculator in high school in the late 70s. And was allowed to use it in class – the nuns in grade school had been none too pleased with new-fangled inventions. But once I started playing with numbers by poking them into the calculator, that’s when things started to click for me. If the nuns had only known what a valuable teaching tool they were avoiding. Couldn’t that be said of an abacus? Those interested in learning more, can go to the Museum of HP Calculators and its Links page. It is possible make an mechanical I.A.? Of course, assuming it’s possible to make an electronic one. Konrad Zuse built several Turing-complete mechanical digital computers in the 1930s and 40s, so it’s just a matter of assembling a whole lot of hardware. It amazes me that vintage Curta Calculators are selling for around $2,000 USD each in decent condition. BUT NOBODY has made Curta-Clones that cost $200 USD (yeah I’d buy in a heartbeat) to $500 USD (OK, I’m still very interested) – especially in China. Someone somewhere must have access to CNC facilities to produce Curta-Clones at this price range by keeping the CNC machines productive during down-time (between other paying projects). Maybe some of those $2K “Curtas” ARE Chinese clones! There might be 3D print plans for a Curta clone on the web. There are, I think it was featured on here a while back. Probably because the expectable market is way too small. To sell this for 200,- you need some kind of series production, you can not get this price if you can only expect to sell 50 pieces. And in the times of cheap electronic calculators and calculator apps on the phone a mechanical calculator is quite useless from a practical standpoint. I blame William Gibson for what market there is, and the $2,000 current value. He spent a good number of pages on this machine in “Pattern Recognition”. Dr. Richard Feynman told in one of his books about repairing mechanical calculators at Los Alamos until they were able to hire a person to do that job for them. I actually owned a flat, slider version of the Pascal machine. I bought it ca. 1972, and it easily fit in my shirt pocket. The device has vertical sliders, one for each digit. To add to any column, you simply insert a stylus into the appropriate hole, and slide the slider down to zero. The result appears in a little window above each slider. If the slider won’t go all the way down, it’s because it requires a carry. So slide the slider up instead of down (to get 10’s complement result). At the top, the stylus goes into a little “hook” slot where you can add one to the next digit over. A lot easier to use than to describe, and it requires _NO_ moving parts except the sliders themselves. Yep, very close, even up to the “clear” feature. But I see that the Addiator doesn’t have the little hook in the slot that enables the carry. You have to do the carry manually. So close, but it’s the carry mechanism that’s the big challenge for any calculator. Without that, the Addiator falls flat. Here’s a link to Jaap’s page, which describes the “hook” mechanism for carries. His video shows how it’s done, but unfortunately he’s using a calculator designed to add British currency. Rats! My workplace blocked the link, claimed it is “games”. It looked to me like the Addiator had the little hook in the slot you were talking about. It also appeared that the person making the video Graham Tanner linked to didn’t fully understand the device. He really bungled the concept of a carry. Oh, Ok. I hadn’t thought that he just didn’t understand. Thanks for the explanation. Yeah, my Addiators carry okay.